Hello everyone and happy weekend to you! Today I have just a fun little card to share with you. I made this last night to take along with me when I met a fellow stamper, SCSer Dawn (flowergal36). We met for coffee this morning and I just wanted a cute little fun card for her. This is really her style of card... a top fold, a cute image, and a wide ribbon at the top. I have come to love this style too... it just works so well with most images! This is a little Penny Black stamp that I picked up at a consignment sale at a local stamp store! I just love when I get a bargain on something I love! I love Penny Black designs! I stamped this one with Archival Jet Black and colored it with Prisma Pencils and blended with goo gone. I used Old Olive as the base and the dotted designer paper is Lasting Impressions "Kiwi Dots". I love the colors in this dp and thought it went perfectly with OO. I ran the dp through the cuttlebug and added some dew drops, stickles and glitter gel pen. Inside I cut a Nestie Label one shape and stamped a Studio G sentiment that says Some Bunny Loves You. It's just a cute little springy card. I hope you have a wonderful weekend! Don't forget to stop in and say hi at Women to Women this week! Grace, this is such a cute little card and I bet Dawn loved it!!!!! Two sweet women meeting for coffee isn't that something?!?! ohhh wowww Grace,what a beautiful card,l love the colour. This is beautiful Grace! I'm sure Dawn absolutely loved it. How wonderful you two get to meet and share time together in person!! 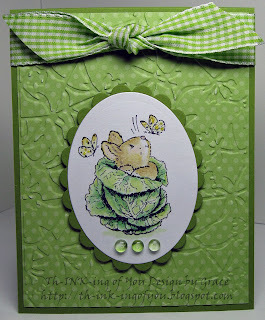 I love the embossing on the DP - it looks like the sweet little lettuce leaves that cute bunny is in! Oh Grace that little bunny peeking out of the cabbage is just too cute! And I like the embossed paper too, such a well coordinated card. And I love the song you have on your site. But there are so many . . . This bunny is adorable and I love the CB bg paper! It is just the PERFECT touch! This is such a great card Grace. I love it and YOU... Have fun with your family this weekend. What great weather. Grace this is beautiful and darling at the same time. Wonderful coloring and darling image. How super cute, Grace...I just love that image, your beautiful coloring, and the background is gorgeous!!! How adorable. Just love little bunnies and this image is so cute. What a darling card...your friend will ooooh and aaaahhh! This card is so pretty. Your coloring of the image is fantastic and I really like how you used the embossing folder for the background effect. Ooooooooooh....I LOVE LOVE LOVE this! the colors are fabulous and that stamped image is adorable! TFS! Oh Grace, this card just tickles me! I love it! Everything about it! That image is adorable! The colors and paper and dew drops are all great. Your coloring is superb!